IRCTC login on new website and the IRCTC app has a lot of problems as reported by users. It is growing because of rail ticket booked by travel agents and due to more people joining the travel website of Indian Railway Catering and Tourism Corporation Ltd. It becomes more problematic during vacation time when most of the people plan for the travel packages. The online train ticket booking in India started with just 29 tickets booked on the first day and now Lakhs of people are using it daily. The number of users is increasing day by day because of the increase in the accessibility to the Internet in India. For people who newer booked ticket online, it is a very simple process to access your account for ticket booking and train inquiry. You have to open the www.irctc.co.in and then enter your username and password and click the Login button, and that's all. But sometimes users face the issue to login in IRCTC website. Such kind of issue and problems are covered in this post. This post will help you to identify your issue and resolve it. You can also share it to help others. It is a simple process. A login page available at IRCTC website to login into your IRCTC account. For IRCTC next generation login create a new account. Because only registered users allowed to access it. If you don't have an account, create a new IRCTC account. IRCTC sign in is a process to access the secure pages of IRCTC website www.irctc.co.in. These secure pages include "Plan my travel" page "Tatkal booking" page etc. For account IRCTC train login you need a login id and a password. To get, login id and password you need to create an account. The IRCTC login page is accessible, all the time and thus you can log in to your account at any time. It is not easy to log in an IRCTC account during the Tatkal reservation hours. Thus avoid account Indian Railway login during the Tatkal booking timing. To book Tatkal tickets a high-speed internet connection is necessary. It will help you to book a Tatkal ticket fast and without any problem. Also, it is faster and easy to book tickets on IRCTC mobile website and apps. Check moreTatkal ticket booking tips. 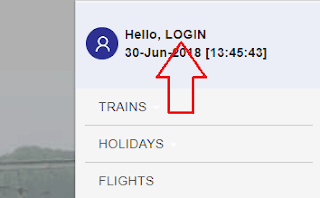 You can also log in to your account to plan travel, check train timing. Also, you can check the PNR status of your booked tickets and seat availability in your desired train. New IRCTC Login on IRCTC website is same. But with a little difference. 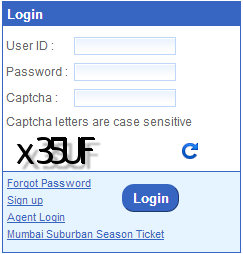 Now you have to type a captcha field also along with the login name and password. Recently the Minister for Railways inaugurated the IRCTC's next Gen e-ticketing system. The new website designed to handle the huge web traffic that the website is getting daily. It was becoming difficult to access the website during the Tatkal ticket booking timing. It was also very difficult to access the Indian railway login page. But the new website is fast and new IRCTC nextgen login form is accessible all the time for ticket booking. Now the new login form looks like the below form. The next generation e-ticketing system of IRCTC is also available on the same URL www.irctc.co.in. You will find an IRCTC new login page. Now look for login Menu button like below. You will find it in the top right corner of the website. When you click the login menu button a sidebar menu will open like in the picture below. Now click on the "LOGIN" text. Now a login box will open in the middle of the website like the picture below. Type your registered user id in the user id field. Next, you have to enter your password associated with the User Id you have entered above. Be Careful in typing your password. And if you have forgotten the password. Then you can get the new one by clicking on forget password link on the IRCTC login page. You have to provide some details to get a new password. The user who is not able to log in the new website should reset their password and then try again, you will be able to login your IRCT account. Now the new thing the Captcha entry. 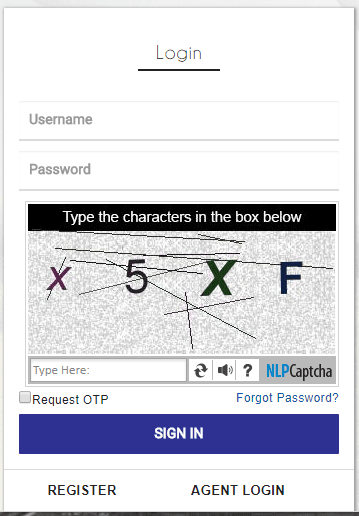 Now you have to type a given set of characters in the Captcha field. These set of characters are randomly generated. And every user gets a different set of characters. If you have a problem with reading the characters you can press the refresh button. Given along with the captcha characters to get a new set of characters. The captcha field allows only real human users to login the IRCTC new login page. Once you enter your user id, password and captcha, verify the details yourself. And if everything is correct then press the login button. If you have provided the correct details on the login form. Then you will provide access to the plan my travel page of the new IRCTC eTicketing system. New users can get user id and password by new IRCTC account registration. The Sign-Up link provided on the IRCTC new login page. Note: irctc.com is different. It is a corporate website and is not for online ticket booking. Once you log in to your account, you can start booking tickets. There is no particular IRCTC login time to access the services of IRCTC. You can log in any time and book ticket. But the time from 9 AM to 12 Noon is the peak time to access the website. During this period many users try to log in from all over India to book Tatkal tickets. So the server is quite busy, and you may face problem to log in. Usually, you will get 'session expired' error message. Also, it's mandatory to maintain correct and updated information in your IRCTC account. 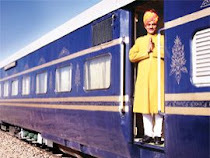 I also have an account with Indian Railways Catering and Tourism Corporation website. And always book tickets online, it is quick and easy to book tickets on the website. But it is a bit difficult to log in it during Tatkal booking timings. We can always contact the customer care if there is any problem with IRCTC login. Login problems are usual. As there is a huge traffic to the servers of the website during morning hours. Especially during Tatkal timings. There may be other reasons also that may prevent you from logging in to your account. Below is an attempt to list out the reasons which may be causing the problem along with its solution. If you are facing IRCTC Login problem to log in then you can follow these steps to log in to your IRCTC account. Always check that you logged in to the secured IRCTC login page https://www.irctc.co.in. Always remember your username and password. You can reset your password but you can't reset or request your username from IRCTC. If you have forgotten your IRCTC login id then you can recover it from your email account by checking the oldest email received from "ticketadmin@irctc.co.in". It is the very first email that sent to you after a successful account registration. If you can not find that email from IRCTC then the second method is to fill the account registration form once again with the same email id. In this case, the IRCTC will not allow you to register a new account with same email id but will show you the username linked to your email. Always maintain a single account. It will help you to remember the correct username and password all the time. And also maintaining many IRCTC accounts is against terms and conditions. Enter your correct username and password. Both username and password are mandatory fields, so always check if you are not missing one of them. Most of the time it happens that the password gets typed in the username field. Which is very unsecured as anyone can see your password who is watching you while logging in to the website. Always check. The case of the characters and special characters used in the password typed are correct. If you have forgotten your password. Then you can reset it if you know the username, click on forgot password link. Provide your correct username then click proceed button. A security question asked to you, answer it to get reset password emailed to you. Clear the temporary cache and cookies on your browser. To make sure that you have the most recent version of the IRCTC website. Otherwise, you can contact IRCTC Customer Care 011-3934 0000 and explain your problem. Also, you can send an email to care@irctc.co.in from your IRCTC registered email id. Explain the problem but always include the following details in your email. And within a few hours, you will receive an email acknowledging your complaint. And within 24 hours you get a reply from IRCTC about your problem. To log in the website you must have a valid account with IRCTC. If you don't have an account then you can open a new account by clicking on the sign-up link provided in the Indian Railway login form. It is very easy to create a new account. It will help you to book and cancel train tickets online faster. If you don’t have an IRCTC account. And new to the online ticket booking system. Then follow the instructions provided for IRCTC registration. And start booking a ticket online from your home, office or any place where you have access to the internet. Also if online ticket booking is a new experience for you then the following is very helpful. Now let us discuss these stages to set up an online ticket booking IRCTC account, one by one in detail. First of all, you need an account to start booking tickets. Because to book tickets, IRCTC needs to authenticate you and manage your details. You can think of a unique IRCTC login id. And a secured password during the IRCTC account registration process. To create an account click this link www.irctc.co.in. 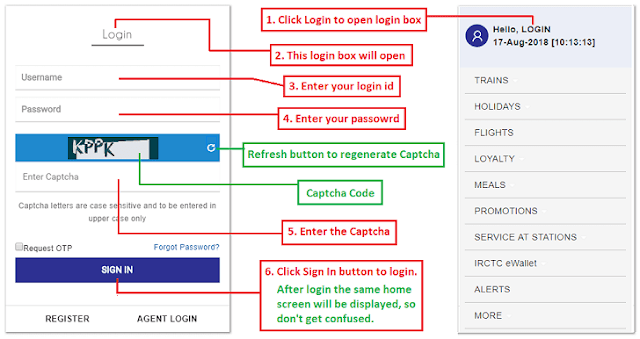 Follow the step by step detailed process explained here for IRCTC account registration. Once you created the IRCTC account, you can log in to the website and book tickets online. You can book E-ticket, I-Ticket (Discontinued from 1st of March 2018) and Tatkal ticket with. There is a difference between these three types of tickets. When you book an e-ticket online, it is not sent to your address but instead provided on your email and mobile. An I-ticket booking requires your address at which it sent to you. The Indian Railways had to send I-tickets at the address you provides. And through a standard courier service. But I-Ticket booking discontinued from 1st of March 2018 by IRCTC. The Tatkal tickets booked on urgent need, one day before the train’s departure. You have to pay extra ticket booking charges for Tatkal ticket booking. E-Ticket booking: Follow the steps to book E-Ticket. Tatkal Ticket booking: Follow the steps to book Tatkal Ticket. Once you book a ticket, you can take a printout of it. An e-ticket sent to your mobile through SMS and thus a printout is not required. You can show E-ticket message that you received on your mobile phone from IRCTC. And also a valid ID-Card during your journey. Even you have the option to cancel your tickets online. You can cancel only those tickets which you have booked through your account. Now tickets booked through the counter window canceled through your account online. You can follow these steps to cancel E-Ticket. On your railway ticket cancellation. The refund will process as per the Indian railway guidelines. After deducting the train ticket cancellation charges money refunded to the user. Once your ticket gets booked. Then knowledge of how to check PNR status and how to spot your train is an advantage for you. You can even spot your train’s location and plan your railway station visit. It is very helpful for the passengers and relatives of passengers. The more information about detailed tips to spot your train. Once you have your account and understands the complete Indian Railway Login process. You can book tickets from the comfort of your home. You can use IRCTC Login mobile application to access your account for ticket booking. Ticket booking through IRCTC mobile application is faster. There is no specific time to access your IRCTC account. Users having a valid account. Can access the website and log in anytime to use the plan my travel page, or for Tatkal booking. But the Tatkal ticketing allowed after 10 AM for AC coaches. And Tatkal sleeper tickets can book after 11 AM. IRCTC new account creation is not allowed between 9 AM to 12 PM. IRCTC login mobile service is very helpful for Indian railways passengers. It helps to book their railway ticket through mobile phones. The service launched by the IRCTC, for booking e-ticket over the mobile phone. To IRCTC login for mobile, open https://www.irctc.co.in/ instead of https://www.irctc.co.in/mobile in your browser. The mobile website URL discontinued by IRCTC. Enter your existing IRCTC user id and password. Click on Book Ticket and fill in details for plan my travel. Select your train and continue the ticket booking. Select a passenger from existing passengers list. Or add passengers who travel along with you. Confirm booking details on IRCTC mobile login application. And pay the fare through Credit/debit card to get reserved IRCTC ticket. You can also book Tatkal tickets in the same way under Tatkal quota. IRCTC login for mobile application needs to download on the mobile handset. It will be simple for the mobile users to book IRCTC tickets through their own mobile. Users can download IRCTC mobile app on the mobile phone and make a login on mobile to book tickets on the go. It is more comfortable to book tickets on mobile. Booking tickets on mobile are also safe. Download only the official app of IRCTC and not other IRCTC login related software. The official app is available on Google play for android mobiles. IRCTC login to the website of IRCTC is necessary to book online tickets. It is a very simple process but sometimes become difficult due to heavy load on the website server. Especially during Tatkal ticketing hours. About 11 AM in the morning, it's almost impossible to access it. IRCTC has launched new next-gen e-Ticketing system to handle the huge traffic load on servers. Now it has become faster and efficient to log in the website. The new website has all new user interface. I had booked a AC 3 Tier reservation in Padatik Express journey date being 03/07/2018. The reservation was booked on 18/6/2018 from my IRCTC ID suman3047. Regarding this, the ticket has not been issued but the amount has been deducted from my bank account of Punjab national bank-SB AC No 1201000100134021. Please inform me about the same immediately. Hi Suman, I hope you have got your refund till now. Usually it takes time of at least 48 hrs. How to open MY ACCOUNT? Any easy way please? Your query is little bit confusing. 1. If you mean that your email in not verified then you can verify by login into the website first time. 2. If you mean that you already have an account with an existing mobile number but want to update email then your can do same by login into the website and update the email in your profile. i have booked ticket from salem to chennai on 19th august. I need to change the boarding point from salem to morappur. how to change? You can change the boarding point from booked ticket history by selecting the ticket. Change of boarding point is allowed only before chart preparation and within 24 hrs of train departure. How to open my account plzzz help me friends. Check in your registered email account for an oldest email from ticketadmin@irctc.co.in, you will get your login id and with that user id you can reset your password. You can check the details in failed transaction history and status of refund in 'Refund Status'. Usually amount is refunded in 48 hrs. So don't worry you will get it in your bank account soon. You can check your login id in oldest email received from ticketadmin@irctc.co.in and then reset your password. If you have your username and forgotten password only then reset it. On mobile it will open in a popup window with a scroll, you can scroll down to view all the options. On desktop version it is easily available and accessible. Bookmark our website, and use tools available in top header. It will become easier. I can't open and modify my booking details when I enter into my account, click on the option I get only a fade like window. How to clear my problem? How can I creat a agent account in IRCTC ? I am getting problem while booking online ticket. After selecting date and train No. as and when I proceeding for booking window disperse. Please suggest remedial measures.